Need help finding Medicare Supplement plans in Maryland? Learn about Medicare Supplemental plans available, compare options, choose an insurance company, and easily enroll. We save seniors money on their insurance cost. Retirement Transitions was started by me, Dan Owens, to help seniors easily shop for Medicare Supplement plans and rates online. Seniors are bombarded by insurance agents, companies, and advertising that make the decision process more complex. We help simplify the process by presenting you with the facts about Medicare plans in Maryland. We are an independent company that is appointed with over 30 different insurance companies to provide you with the options you deserve. Our team, which includes local Medigap specialists in Maryland, are advocates for seniors looking for insurance. Retirement Transitions helps seniors turning 65, new to Medicare, and people who want to save money on their supplemental coverage. It’s important to get a Medicare supplement insurance quotes when looking for coverage. This will save you money. Seniors are able to enter a few details and get real-time Medicare Supplement quotes in Maryland instantly online. 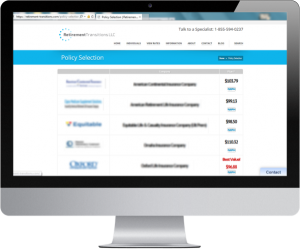 Since we’re an independent company, you will see a price comparison from multiple major insurance companies. Comparing prices for Medigap insurance is so important because it’s the biggest difference between each insurance company and the next. Paying too much for a Medicare supplement plan is not uncommon for the exact same coverage. If you’re interested in getting Medicare supplement quotes now in the state of Maryland, call us toll-free at 1-855-594-0237. A licensed Maryland Medicare supplemental insurance specialist will be able to answer all of your questions and provide you with quotes from major Medigap insurance companies. Our specialist won’t push you into any plan or conversation you aren’t comfortable with. We are saving seniors $100, $200, and up to $1000 a year on their Medicare supplement premiums. The best part of all, the beneficiaries kept the exact same benefits of coverage. If you’re ready to make a decision to apply for Medicare supplement insurance in Maryland, we make the process to enroll easy. Give us a call at 1-855-594-0237 to enroll over the phone. Email Me and I will send MD supplemental quotes or a link to apply for a Medigap plan online. Schedule an appointment to go over facts, options, and apply in person with a licensed MD insurance specialist. 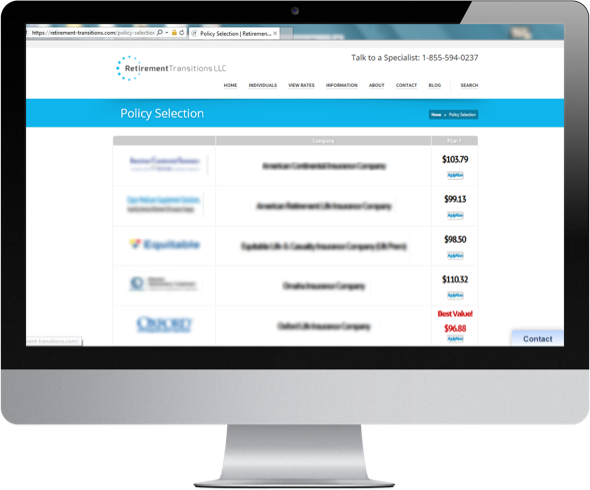 *You will be able to apply for a supplemental insurance plan online when our Maryland Medicare supplement quote engine launches. If you have any questions or concerns about Medicare insurance coverage or the cost of a plan, please don’t hesitate to contact us for support. We’re your advocates when shopping for Medicare supplemental insurance in Maryland.